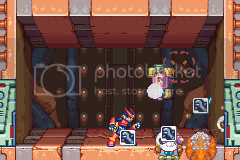 Megaman Zero 4 TAS 15578 frames, or 259.63 seconds faster than the published run by Xaphan. By the last score screen, it is 11821 frames, or 197.02 seconds faster. The dialogues and some non-action scenes in the USA version are far over 30 seconds longer than those in the JAP version. For whoever is interested, the in-game time at the end is 00:19'34. There are many humourous delights hidden in the movie by the author. See if you can spot them all! This movie ends skipping the ending scene and staff scroll. If you think they should be shown, I may upload such one. Bosses may seem to have some frame rules on their patterns of action. This is because every time a boss fight start, the PRNG that is used by the boss to decide its movements, is restarted with the current value of the level timer. As result, a boss's first few possible attacks are limmited, if not decided. 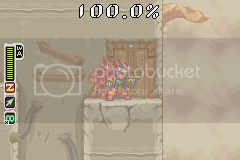 Most of the time, since it's quite time-attack-unfriendly for Zero to cling to a wall during a boss fight, the only way to manipulate a boss is to wait and spare some frames before engaging it. 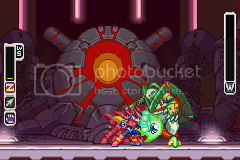 At times, there is a one-frame window on the first controllable frame when you can affect the boss's action, by going towards it, or simply not. Every damage-taking in this movie was intentional and faster than not to do so. Taking damage gives Zero temporary invincibility that enables touching spikes without dying, or simply prevents from taking more damage in 1.5 seconds. 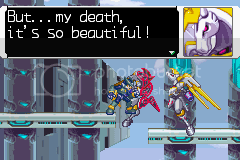 It also interrupts Zero's movement like attack recovery. As a result, it saves time during both level attacks and boss fights. Recovering health pauses all in-game actions for a short while, whose length depends on the amount of the recovered health. Generally, this is avoided in the movie, while it is used unavoidably in rare cases. 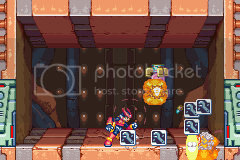 I hadn't planned to make and use the double-jump chip before I found it did save time in Ragnarok Control Room. Then, I went back to Particle Beam stage and re-manipulated luck there to obtain the required parts and made it along with the Junk Armor. However, making it any earlier for use before Settlement under Attack would require an extra trip to and fro the lab, which would be just too long to save any frames, but become slower than the current stategy in the end. 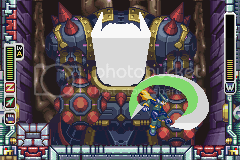 As long as Zero is equiped with the full set of Junk Armor with the Cyber-Elf disabled, all received and delivered damage (except for grabbed/discarded weapons, Skull Crush, Ice Blade wave and Sky Chaser rocks) is doubled. The route used in this run is overall based on producing and utilizing the Junk Armor as soon as possible. The stage orders in this submission were different from that in the published movie (reordered in the sheet). So it's very clear that the dialogues in the USA version are much longer. 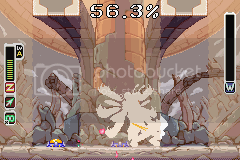 I delayed the last final slash on the boss for a few frames for the boss's missile to hit Zero at the same time. 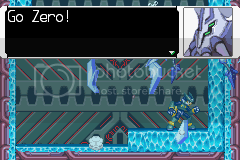 Taking this damage interrupted Zero's standing slashing animation and repelled Zero down to the ground during the boss's death animation, in which the game would prohibit any user control. This trick averted the need to manually jump down the platform after the score screen, saving much more frames than the delay cost. Thanks to Inti-Creates and Capcom for producing and publishing this game. Thanks to all the VBA and VBA-variant developers for making such a brilliant rerecording emulator of GBA. Thanks to gocha for making VBA Watch. It didn't work with VBA-rr v21.0 due to some CR+LF problems, though. Now it's solved. Thanks to Maximus for making TAS Movie Editor. Thanks to (in alphabetical order) Bag of Magic Food, BoltR, computerbird, jaysmad, KaitouKid, McBAIN, mikwuyma, moozooh, mukka, NrgSpoon, OgreSlayeR, shikarii, Too_Bored, Truncated, Wren, Xaphan, zefiris, zhangsongcui and Zurreco for various route and strategy suggestions as well as other constructive comments. Thanks to (in alphabetical order) Iriasu, McBAIN, Vector188, Xaphan, zefiris specially for their excellent speedruns. Thanks to computerbird specially for making various tests. Thanks to every whoever hosting, administrating, contributing to and/or visting this site. This submission has been updated once with a 41 frames faster movie than the old one. Only the improvement from the last boss fight is visually different. Previous savestates are likely to fail again. I'm sorry for the convenience. adelikat: Replaced submission file with a new one by the author. This new one is 41 frames due to some minor improvements. also, accepting as an improvement to the published movie. klmz: Wow ShinyDoofy you are still here with us!